We’d love your help. Let us know what’s wrong with this preview of 30 Days to Understanding What Christians Believe in 15 Minutes a Day by Max E. Anders. In this updated volume of his popular 30 Days series, Dr. Max Anders presents the essential truths of Christianity in the clear, conversational style his readers have come to expect. 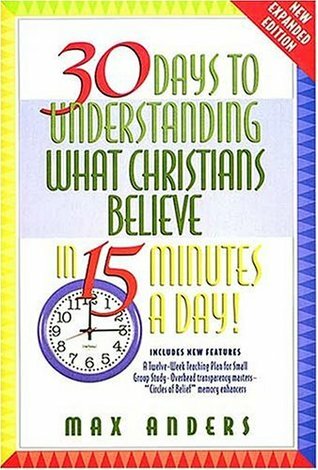 30 Days to Understanding What Christians Believe gives you a comprehensive overview of the fundamental Christian doctrines and beliefs-in just 15 minutes a day! Using memorable examples and dow In this updated volume of his popular 30 Days series, Dr. Max Anders presents the essential truths of Christianity in the clear, conversational style his readers have come to expect. 30 Days to Understanding What Christians Believe gives you a comprehensive overview of the fundamental Christian doctrines and beliefs-in just 15 minutes a day! Using memorable examples and down-to-earth language, Dr. Anders explains the ten major subjects of systematic theology: the Bible, God, Jesus, the Holy Spirit, angels, man, sin, salvation, the church, and future things. To ask other readers questions about 30 Days to Understanding What Christians Believe in 15 Minutes a Day, please sign up. I am thoroughly enjoying the book... and learning. I sometimes forget the context of a Scripture or the timeline. I still felt a bit of trepidation when I saw the book, but the first chapter put me at ease. I got all of the test answers correct, so that gave me a bit more confidence. Of course, it does become more challenging as you progress, but the structure of the book really helps. In the past, I have given up, even when using the chronological method of reading my Bible, so this way of foll I am thoroughly enjoying the book... and learning. I sometimes forget the context of a Scripture or the timeline. I still felt a bit of trepidation when I saw the book, but the first chapter put me at ease. I got all of the test answers correct, so that gave me a bit more confidence. Of course, it does become more challenging as you progress, but the structure of the book really helps. In the past, I have given up, even when using the chronological method of reading my Bible, so this way of following a plan is very useful. I definitely recommend this book to anyone wanting to understand the Bible better.